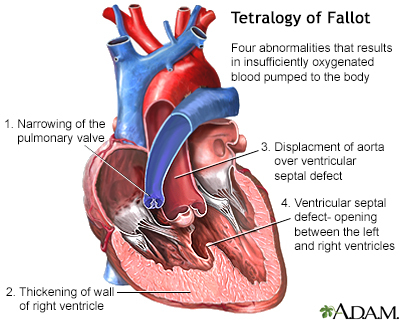 Tetralogy of Fallot causes low oxygen levels in the blood. This leads to cyanosis (a bluish-purple color to the skin). 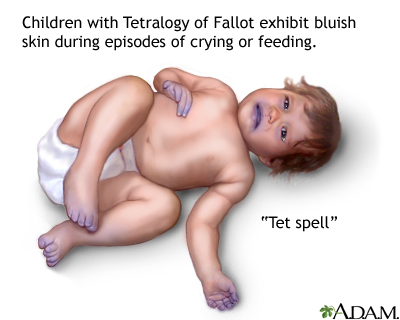 Tetralogy of Fallot is rare, but it is the most common form of cyanotic congenital heart disease. It occurs equally as often in males and females. People with tetralogy of Fallot are more likely to also have other congenital defects. The cause of most congenital heart defects is unknown. Many factors seem to be involved. Children with tetralogy of Fallot are more likely to have chromosome disorders, such as Down syndrome, Alagille syndrome, and DiGeorge syndrome (a condition that causes heart defects, low calcium levels, and poor immune function). A physical exam with a stethoscope almost always reveals a heart murmur. Surgery to repair tetralogy of Fallot is done when the infant is very young, typically before 6 months of age. Sometimes, more than one surgery is needed. When more than one surgery is used, the first surgery is done to help increase blood flow to the lungs. Surgery to correct the problem may be done at a later time. Often only one corrective surgery is performed in the first few months of life. Corrective surgery is done to widen part of the narrowed pulmonary tract and close the ventricular septal defect with a patch. Most cases can be corrected with surgery. Babies who have surgery usually do well. More than 90% survive to adulthood and live active, healthy, and productive lives. Without surgery, death often occurs by the time the person reaches age 20. People who have continued, severe leakiness of the pulmonary valve may need to have the valve replaced. Regular follow-up with a cardiologist is strongly recommended. Call your health care provider if new unexplained symptoms develop or the child is having an episode of cyanosis (blue skin). If a child with tetralogy of Fallot becomes blue, immediately place the child on their side or back and put the knees up to the chest. Calm the child and seek medical attention right away.